Seasonal Fall Produce: Five to Try, and Why. Seasonal fall produce. That phrase evokes visions of persimmons, tangerines, butternut squash, pears, pomegranates and mandarins. All foods that give me the warm fall fuzzies inside. Seasonal: In Style for Foodies. The word seasonal, is quite the trendy buzz word nowadays. You'll find chefs and foodies everywhere spouting off on the glories of using 'in-season' ingredients. Who is in on this trend? Everyone from Michelin Star restaurants like Jean Georges, the New York Times Food Section critics, the judges on Top Chef and even the foodie hosts on Food Network Shows. If it's not seasonal, why even bother. Pomegranate flavored everything is so trendy nowadays. 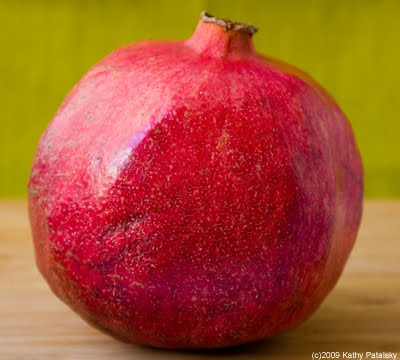 But the nutrition and taste of a pomegranate will never go out of style. Try fresh pressed juice, add the seeds to salads and savory dishes. You can even make delicious festive party drinks using pomegranate juice. Sweet, tart and crisp. Tastes like the holidays to me. Why Eat This: Pomegranate juice is an excellent source of potassium, vitamin K and is particularly high in three types of polyphenols (antioxidants): tannins, anthocyanins, and ellagic acid. Studies have shown that pomegranate juice may be effective in promoting prostate and cardiovascular wellness. So many pears, so little time. Pears range in variety from the elegant Bosc and the large Comice to the more standard varieties like Bartlett. I recently picked up a bag of Seckel pears at my local farmer's market. 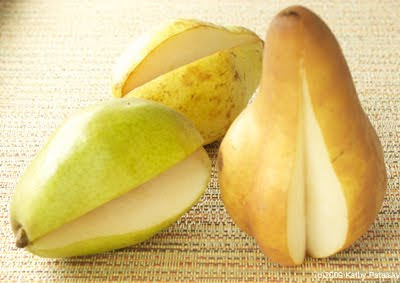 They are tiny little pears that resemble mini-bosc's with a smoother skin. They were fantastic! I highly recommend seeking out the Seckel Pear. Plus, they are so darn cute. Why Eat This: Pears are a great source of fiber, vitamins C and K and the important electrolyte potassium. There are so many varieties of winter squash. I am obsessed with trying them all! 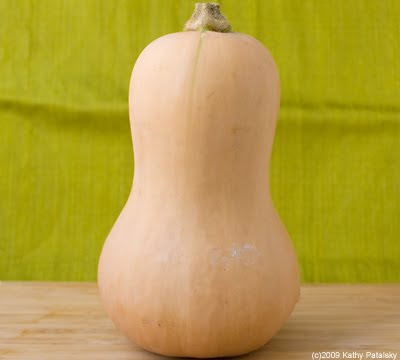 But the most well known (all are varieties I have seen at my local Whole Foods Market) include: pumpkins, butternut squash, acorn squash, carnival squash, hubbard squash, kabocha squash, speghetti squash, banana squash, delicata squash, buttercup squash, sweet dumpling squash and turban squash. 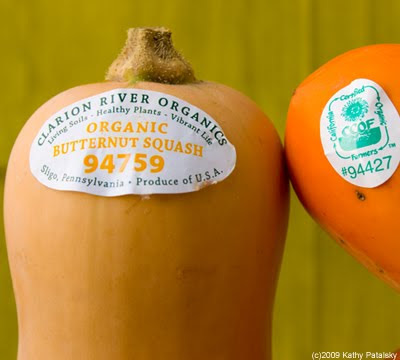 My personal favorites are a white acorn squash variety, butternut squash, delicata squash and buttercup squash. You really can't go wrong with butternut squash because it is always a crowd pleaser and contains fewer seeds/more flesh than most other varieties. 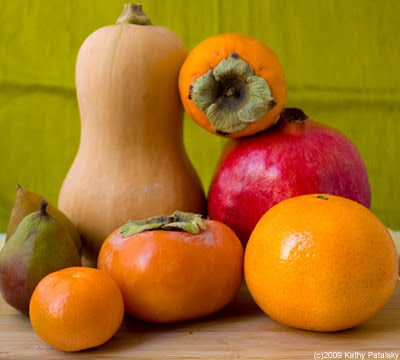 Why Eat This: Winter squash are high in vitamin A and fiber. Super cleansing and sweet tasting whole food complex carbohydrate. If you like sweet potatoes and pumpkin pie, I'd suggest getting creative with winter squash. 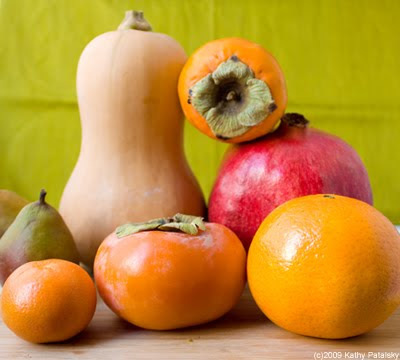 Go for darker colored squash for a higher concentration of vitamin A. There are two varieties that you will find in most any store this fall and winter season: Fuyu and Hachiya. Fuyu's are the short and stout variety (they look kinda like a tomato). Fuyu's can actually be eaten while slightly firm (although I still prefer them soft). Hachiya persimmons are the more traditional pointy variety. DO NOT eat a Hachiya until it is super-soft and mushy inside. The longer a persimmon or fuyu ripens, the sweeter, creamier and 'liquid' it will be. You can literally eat the flesh of a super ripe hachiya (or even a fuyuy) persimmon with a spoon. Delicious! 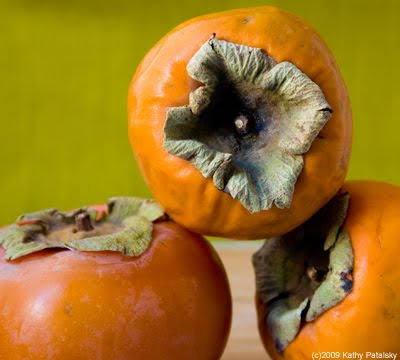 Eating a hachiya persimmon before it fully ripens, is like biting into a sweater. And that experience can scar you for life into hating persimmons. 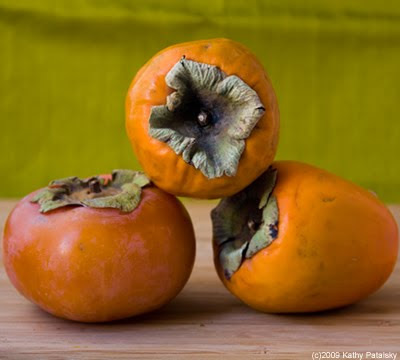 I think most foodies will agree that persimmon and fuyu season is a welcome time of year. I recently bought several creamy orange colored hachiya gems and let them sit in my fruit bowl for weeks until the ripened. A true lesson in patience. 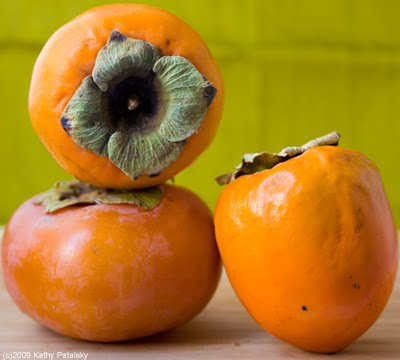 Why Eat This: Persimmons are a great source of vitamin A, B6, C and manganese. 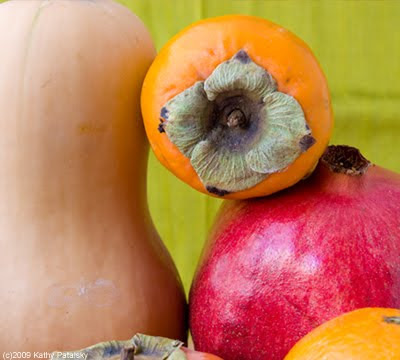 One persimmon can have 6 grams of fiber! That's more than an apple. If you've only been eating oranges, you're missing out! Winter citrus offers some of the sweetest, juiciest and freshest flavors and citrus varieties all year round. 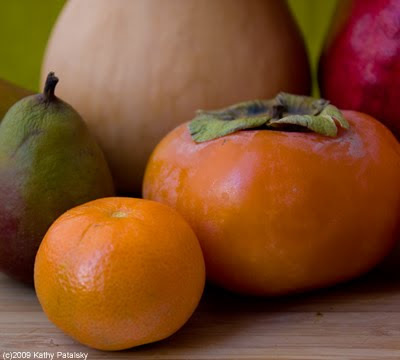 Winter citrus includes: Oranges, Mandarins, Grapefruit, Tangerines and more. 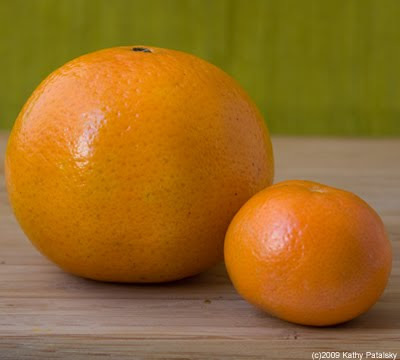 There are many exotic varieties of mandarins and tangerines that each have a unique flavor. Some are ultra sweet while some are bright and tart. Some citrus is rich and juicy like Valencia oranges (perfect for juicing) while other varieties like Navel oranges are perfect for peeling and eating because of the sturdy flesh. Why Eat This: All varieties of winter citrus are rich sources of vitamin C; they contain potassium and citric acid; and their peel contains valuable aromatic oils. Citrus pith contains bioflavenoids, needed by the body to absorb vitamin C.
Fruit: cranberries, apples, grapes, guava, huckleberries, passionfruit, banana, lemons, papaya, pineapple. Veggies: Avocados, Bok Choy, Broccolini, Cabbage, Carrots, Celery, Leeks, Mushrooms, Onions, Parsnips, Bell Peppers, Potatoes, Acorn Squash, Broccoli, Brussels Sprouts, Butternut Squash, Cauliflower, Celery Root, Chayote Squash, Radishes, Garlic, Ginger, Jalapeño Peppers, Kumquats, Mushrooms, Pumpkins, Quince, Rutabagas, Sweet Potatoes, Swiss Chard, Turnips, Winter Squash. *just make sure to (try) and buy organic, local and sustainable produce! Farmer's Markets (even in fall/winter-if you can find one) are best!